We all saw the Miami Heat busting through the preliminary playoff rounds. In fact, the dominance the Heat exerted in the past two months was so convincing, that I called a Heat three-peat. Signed. Sealed. Delivered. But not quite. The San Antonio Spurs rubbed off the signature, broke open the seal and shoved the delivery off a cliff. The vets — Tim Duncan, Tony Parker and Manu Ginobili — led the team to a crushing 104-87 Game 5 victory. And leading up to that, the squad demoralized the boys from South Beach with Game 1, Game 3 and Game 4 sweeps — not even close. The closest win? 15 points. The point spread of the sole loss? 2 points. An NBA finals series manhandling as pure as this one may never be seen again for a long while. 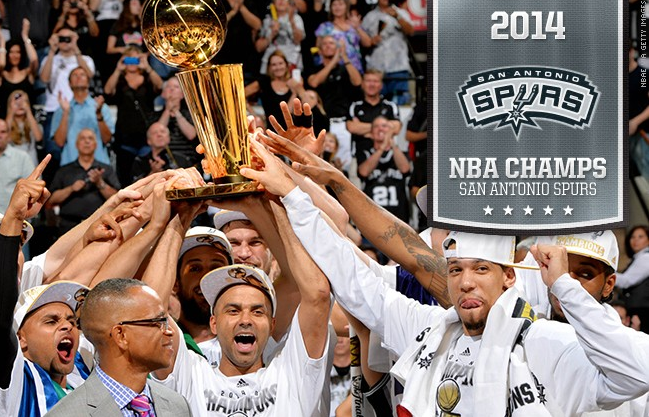 This Spurs team showed off pure teamwork and dedication — no cliche. The locked future hall-of-famers did not come close to the MVP Finals trophy. Instead, they moved out of the way for 22-year-old young gun Kawhi Leonard — the man of few words who dropped his career-high 29 points just last week. The craziest thing is that Leonard adding the Finals MVP hardware to his trophy case doesn’t begin to explain the Spurs team. Collectively in the five final games, the Spurs’ Patty Mills hit 13 threes to Ray Allen’s 9. Boris Diaw came up huge toward the end of the series in ways that don’t grace the stat sheet. Danny Green had his moments, as did Marco Belinelli. Cap that off with Coach Gregg Popovich providing the game plan — “move or die” — and it fused together to form a fundamentally sound, well oiled machine. Motivated by last year’s heartbreaking loss to the Heat, rarely were smiles cracked until that last second ticked off the clock. No matter what NBA team you root for, you have to appreciate it. The Spurs are historic. I wasn’t alive during the Showtime Lakers era or the majority of the Michael Jordan Bulls era. To be able to see this decades-old Spurs team exude this level of confidence over the incredible span of time is something special. Calculated and always prepared, the international team in Texas has swept the stereotypes of basketball age. Five rings in 16 years. Drop the mic. The Heat did not just crumble tonight, they were pulverized into dust. What happened? I could rattle off some stats, but I think the following facts can speak for themselves. Patty Mills’ hands turned to gold as he sunk three after three, finishing with 14 points. Boris Diaw almost notched a triple double. Coach Spo gave Toney Douglas playing time. Kawhi Leonard dropped 20. Notice that I haven’t even mentioned Tim Duncan, Tony Parker and Manu Ginobli — it’s because I don’t have to. You could’ve sat Parker and Duncan the entire game and (basing this solely off points scored) the Spurs still would’ve walked away with a win. I haven’t mentioned LeBron James, Dwyane Wade and Chris Bosh either — two of those three didn’t bother showing up. And combined, their plus-minus plastered a whoppingly low -53. With the way the Spurs have been shooting and whipping the ball around, who knows if anyone can beat them at this rate. The Spurs have turned basketball into an art form, while the Heat are turning it into a bloody mess.